Two of my favorite things would be traveling and be eating at fabulous restaurants (my husband doesn’t count as he is always my number one). NYC is a quick train ride away from Philadelphia and every time I head there you will find me dining at the delicious Fusco. It’s magical! 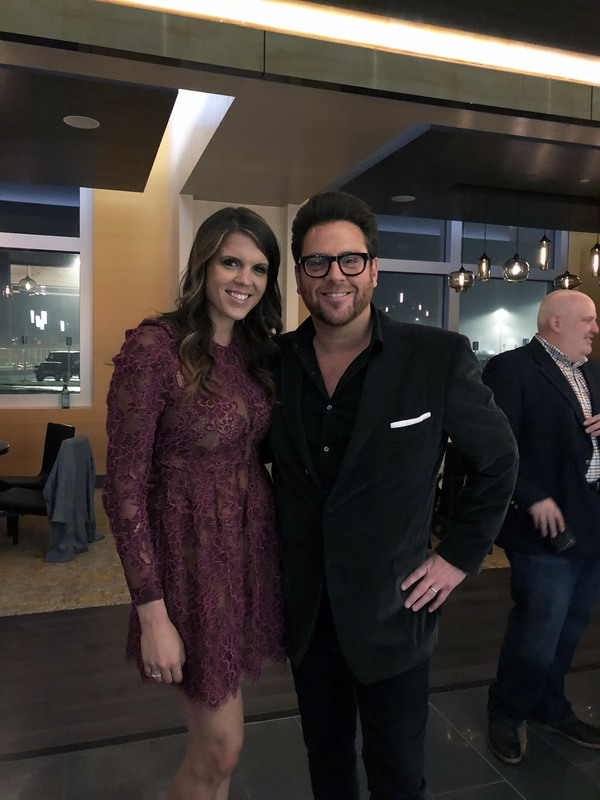 Because I’m such a fan of Fusco, I became acquainted with the wonderful staff members of SC Restaurant team, and on numerous occasions, I had the opportunity to meet the owner, restauranteur/executive chef – the one and only Scott Conant. Yes, the same one from many hit television shows on the Food Network channel. Meeting people (especially celebrities) is always a 50/50 toss up on whether or not your encounter will be an enjoyable experience. And ever since I had the opportunity to meet Scott Conant at Fusco, every encounter has been delightful. He is extremely down to earth and exceedingly passionate about what he does. This passion also trickles down to his staff, both in the back of the house and front of the house. Because I’m a regular at Fusco, Scott’s team invited me to the grand opening of his newest restaurant in Monticello, NY. The restaurant is located in the beautiful Resort World Catskills, and the grand opening event of Cellaio Steak was nothing short of extraordinary. When we arrived at the restaurant the experience from beginning to end was wonderful. Scott was there as we walked up to the restaurant and greeted us as if we were old friends. He is really good about making you feel like he remembers you even if he doesn’t (I mean the guy meets millions of people, so well done!). I had the opportunity to also met his wife, Mel, and she was lovely. Like him, Mel was very down to earth. I can see how much love they have for each other and support each other in everything they do. After some time, we were then escorted to the bar where we found a very robust collection of wines (over 500 to be exact) and signature cocktails. We drank Manhattans, sipped on amazing champagne and a variety of classic wines. If you love wine, you must see Cellaio Steaks wine collection. You can learn more about Cellaio Steak menu here. The wine listing is incredible and super easy to pair with any dish you order. After a few hours of cocktails and mingling, we were taken to our table in the dining room for the well- anticipated food. Yes, it was epic! Scott had small plate tastings of all his famous plates of pasta, along with seafood, bread and carving stations. And let’s not forget about the famous cheese wheel of truffle risotto. The food was so amazing, that I devoured it before I could even take a photo (whoops)! The entire staff made sure that each table was fully attended to and that everyone had enough of Scott’s famous Pasta Al Pomodoro. Our server Tyler (pictured below) knew of my profound love of the Pasta Al Pomodoro and made sure I had my fair share. Thank you, Tyler! After dinner, we went back to the bar and chatted with other guests and meet with additional members of Scott’s team. Everyone was just as fabulous as the next one. My personal favorite had to be Scott’s right-hand man and pasta sauce creator (pictured below), he has been with Scott since the very beginning. I was totally tempted to kidnap him so he could teach me his ways. But that wouldn’t be fair to all of you! The night was topped off with another manhattan and a glass or two of champagne accompanied by a variety of decadent desserts. Did I mention how out of this world their manhattans are? We couldn’t get enough! We were drinking them so fast, the glassware couldn’t keep up. Yummy! One of my favorite things about Cellaio Steak was how warm and inviting it was. The people, the ambiance and the cuisine are very sophisticated. Scott and his team were excellent hosts and the company was amazing. Don’t let the name fool you, this is not your traditional steakhouse. Scott has married his Italian inspired cuisine perfectly with a steakhouse vibe. We were having such a fabulous time that we didn’t want the night to end. But all good things have to come to an end and as we all walked away, we were gifted one of Scott’s cookbooks. It really was a fabulous evening. Thank you again very much to Scott and his team for inviting me to the grand opening of Cellaio Steak. This truly was a fabulous experience and we cannot wait to see the continued success for years to come. Can’t make it to one of Scott’s restaurants? Order his amazing cookbook and enjoy his recipes from the comfort of your own home. Here is a photo of Brandy (from Nutmeg Nanny) and I. Brandy and her husband (not photographed) were delightful, and we instantly connected. Brandy is a food blogger and you can find more details on her blog here.